A jewel in the heart of the oldest part of Antalya, Kaleici. Here you can found a small intimate timeless guesthouse where they says; “Here are no strangers only friends you never met before”. Welcome to Palm House 17 an intimate guesthouse where you will be delighted to spend time, without noticing the time that goes by. The part of city where our guesthouse is located, Is the oldest part of Antalya. It called Kaleici what means: In the castle. Still now you can see a lot of historical building and charm small streets with shops, bars and restaurants. In the narrow bustling streets you can walk easily to the old port. The building where Palm House 17 is located has a long history. It was built in 1895 as a villa for the first pharmacist of Antalya and his family. At the end of WW1 Antalya was briefly occupied by Italian Troops before becoming part of the Republic of Turkey in 1921. From 1919 till 1921 this building was the Italian Consulate by Marquis Eugenio Camillio Garroni and Colonel Alessandro Ciano. After them a different kind of people with different nationality lives here in this residence. After all this years the building never lost his charm and special atmosphere. Interior Design. We take a lot of time and love for details, to make our small guesthouse to a grand atmosphere style. It is a fine mix of oriental and western style interior inspired by travelers on The Silk Route passing by in Turkey. It is also a traveling in time, a delicate mix of antique and modern interior. Inspiration by the early world travelers from the past and how people lived in the colonies. Every room in this building has his own unique atmosphere, furniture and details from Europe and the Orient. Outside on the terrace with flowers and beautiful umbrellas you can read relax a book from our library, watch a movie from our cinema club, enjoy in the morning delicious breakfast and meet new friends. Here the West meets the Orient. 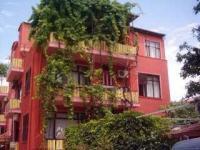 HOTEL ROYAL HILL is central to all curiosities of Antalya. The beach Konyaalti is at 1min. walking distance, The Well known Aquapark is at 5min. and the old historical center of antalya is 10min. from the Hotel. The airport is 12 km from the Hotel. We also have different facilities such as a big swimming pool, Fitness centre,Turkish Hamam&sauna and four congress rooms. We gladly receive you in our Hotel Royal Hill, Which is situated at the world famous beach Konyaalti and it enchanting blue Mediterranean sea surrounded by The mountains of Beydaglari, Where you come to a complete rest in the peaceful atmosphere of Turkey . Otelimiz Aile ortamında hizmet vermektedir. The pearl of Meditterranean, Hotel Perlamare is located at the Konyaaltı beach in the meeting point of Taurus Mountains and the blue Meditterranean, at the distance of 20 km to Antalya International Airport and 5 km to Antalya Kaleiçi the ancient city center. Swimming pool, Turkish Bath, Sauna, Fitness Center, Health Club,Massage Rooms,Solarium,Disco, Children Play Section are some of the offered activity facilities in Hotel Perlamare The air conditioned meeting hall (50 maximum) features Sound & Light system including microphones, speakers and projector. There are 2 suites and 54 Standart rooms with a capacity of 130 beds featuring Sea view, Balcony, Carpet floor, Bathroom, Wc Satellite Tv, Minibar, Aircondition, Safe Box ( Laptop- Notebook size ) Guests are served in an Indoor & Outdoor Restaurant with a capacity of 100 people lobby bar, vitamin bar and disco bar are the other entertainment facilities. 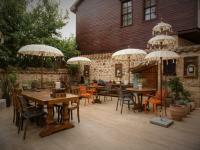 The Camel House is located in the middle of the romantic picturesque Old Town (Kaleiçi) of Antalya. It was in 2008 completely renovated. It has three singles, three double bedrooms (one with balcony) and two apartments, one for two and one for up to four guests. A free Internet access and wireless LAN is available. Similarly, we also offer a small selection of German books. All rooms are equipped with shower, toilet, air conditioning and satellite television equipment. The apartments also have a kitchen with refrigerator, crockery and cooking facilities. Die Straße vor der Camelpension in Antalya Due to the location is a very good pension as a starting point to explore the narrow, narrow streets of the old city of Antalya and the surrounding environment or more to explore. Aussenansicht der CamelpensionOn request, we inform you about the sights of Antalya and the surrounding area and provide you with boat trips and excursions, if you wish. Of course, we also obtained a free city. you are on foot in ten minutes at the old marina. In about the same distance is the Hadrianstor and thus access to the city center and tram. Another ten minutes, you need to go to the Yivli Minare and the clock tower and the local pedestrian zone with its rich stores and shops in a new window. Also found in approximately the same distance a (chargeable) small beach. On the following pages you will find a small room with pictures of accommodation, a map as well as the contact and price information. We hope you enjoy browsing through the page. UNUTULMAZ BİR KONAKLAMA DENEYİMİ YAŞAYIN.. Doğan Hotel'in özgün tarihi güzelliği dekor ve ortamdan geleneksel mutfağına ve personelin içten gelen samimiyetine kadar her yerde kendini gösterir. Her şey Kaleiçi mirası ile zenginleşen harika bir konaklama deneyimi yaşamanız için tasarlanmıştır. Dağ manzaralı 7 oda, toplam 27 yatak, TV, merkezi ısıtma, çift yataklı, duş - tuvalet, sıcak su, saç kurutma makinası, telefon. Karadeniz'in geleneksel mimarisine özgü, 5 tane balkonlu Serendeler - ağaç oymacılığı tercihlerinize sunulmaktadır.